Thank you for visiting our website, we hope you like it. 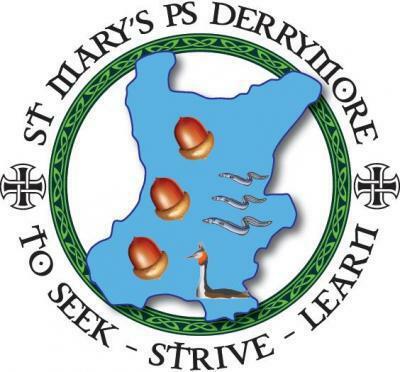 We aim to use our website to keep parent's, children, family and anyone who is interested, informed about what is happening at St Mary's Primary School, Derrymore. We will be keeping our website up to date with weekly events so keep coming back as there will probably be something new of interest to you! The Elvers - reminds us that we are here to guide the young on their quest for knowledge during seven very important years in their life. The Great Crested Grebe - is an annual migrant. It’s coming serves to remind us of the changing seasons, of eternity and of the eternal values to which we are all committed. The Motto “To Seek, To Strive, To Learn” - reminds us that our lives and our actions modelled on those of Christ are sure means of leading others to him. It is a constant reminder of the promise of Christ to his followers “He that shall do and teach shall be called great in the kingdom of Heaven” (Matthew 5:9).